Photos taken from the CCAD Alumni Facebook page. May was incredibly busy. School wasn't exactly easy - senior year was, frankly, more exhausting physically, mentally, and emotionally than any other point in my life. Not to sound dramatic, but that is the truth. April-May brought the launch of another pop-up store, finals, my return to work, moving out of my apartment, planning the final details of a wedding in another state, a wedding reception, and later, writing a speech the week of graduation. It was a very busy 3 weeks. Depending on your goals, you might not think it was worth it. Sometimes I don't either. I closed off communication with friends and family. I worked endless hours and pushed myself to the point of illness. I had no boundaries. I was not healthy. Frankly, I'm not sure how I walked in the photo below. But I also did some amazing things with some amazing people. I felt the love and support of all the people (who despite my alienation) showed me nothing but love and kindness. I did nothing to deserve their grace but I am so grateful for it. I have a senior portfolio that is diverse, risky, and that I love (stated, with the assumption that I know it's definitely not the prettiest baby in the daycare). I made new, unexpected friendships that brought laughter at 2:00 am when my bones ached with weariness. I have the support and backing of an institution, which, at its core, are people. People I was blessed to get to know well. These things, I would trade for nothing. But, let me make this clear- that does not mean that I glorify those sleepless nights and back-breaking workload. If anything, they imbued a deep loathing for the American work culture (especially in advertising) and unspoken opinion that if you punched the clock at 5:30 when you had every right to, you didn't really want the job. But that's another post for another time. It simply means, that priceless moments emerged out of a monstrous schedule that they had no right to (thankfully). Photo taken from the CCAD Alumni Facebook page. I was honored and humbled to receive commendation for my efforts. I would be lying if I said I approached college without ambitions. I am happy that I met my goals. But I was still astonished that I did. 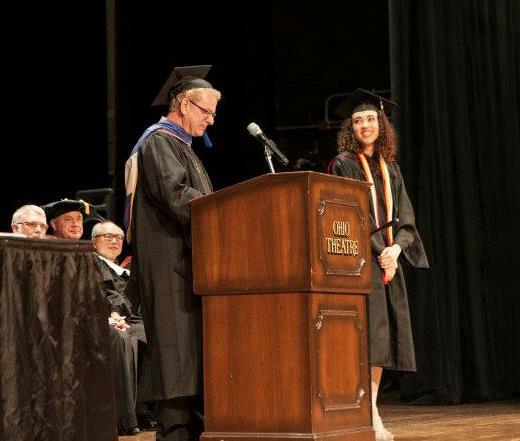 I cried when I learned that I was named CCAD's Outstanding Senior in Advertising and Graphic Design by the faculty. And no fake beauty pageant tears - I'm talking the real, snotty, messy deal. When Kevin Conlon, CCAD's Vice President of Academic Advancement, called to tell me that I was Valedictorian, the only reason I think I didn't cry was because by that point I was on full autopilot, and my body probably couldn't afford the loss of moisture. But my insides were practically ballroom dancing. It was a bittersweet tango between excitement, and gut-wrenching fear. Because, it's true, that our toughest crowd is our peer group. And now I had to address them. Ugh. It's bad enough presenting in class to sleeping classmates - a commencement speech would be worse. By the time the Valedictorian takes the stage, your stomach is rumbling and you've sat for two hours, bored, except for the minute when your loved one prances towards their degree. I had no illusions. I wrote and re-wrote my speech. No stranger to large crowds, stage-lights, and public speaking, my ankles still trembled when I took the podium. I'm not a writer of any sort. My words were not eloquent. They were not witty. They weren't rehearsed since I scratched my original speech the minute I saw the crowd. They were from the heart to both those who were happy to see me up there and to those who weren't. Here are the highlights, if for no other reason than to remind myself, as I am often the first one to forget my own advice. 1. Take pride in your work. Recognize your worth. Recognize that you still have a lot to learn, but don't belittle yourself with crippling comparisons and false humility. 2. Accept compliments, graciously. The giver has gone out of their way to give an honest, positive opinion of how they feel about you or your work. Do not throw it back in their face. 3. Thank the people who got you where you are. You did not get to this point on your own. And lastly, if anyone from that commencement reads this, thank you for patiently letting me publicly thank those special individuals who went above and beyond during my four years at CCAD. God knows, they deserved the recognition at least. Here's to you CCAD - you were always just the beginning.